Well, I’m now a week past knee surgery, and things seem to be going well. I’m now walking around the house with the brace, and have ditched the crutches for the most part. 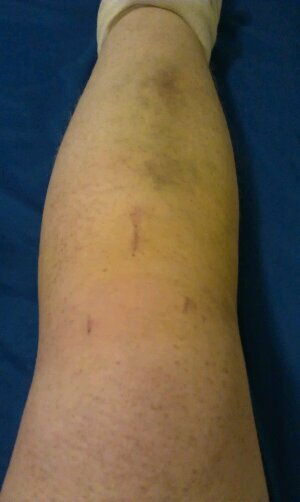 The knee still feels weak (sometimes more than others), but most of the time it feels good. I haven’t felt the need to have a lot of pain medication, and it’s only in the last couple of days that I’ve actually felt any discomfort, which has been taken care of with some paracetamol. On Sunday, I was at Church, and we had a long day, in having a corps lunch and then an afternoon meeting. By the time I got home, I was desperate to get the brace off, and my leg was incredibly tired. I went to the surgeon on Monday for my post-op check. He was very pleased with how the wounds were healing, and said that the wounds and the swelling were progressing above average. Good news! I mentioned that I expected to be in more pain than I had been in. He responded saying that most knee surgeries come out with the patient being pleasantly surprised, and most shoulder surgeries going the other way. I wonder why that is? Anyway, I keep going on with my exercises. I’m slowly rebuilding my strength and flexibility. I have the exercises to take me up to 6 weeks without a physio, however I’ll probably go see one anyway just to keep me motivated and ensure I’m heading down the right track.